Despite Type 1 diabetes, Creston Vaught, 14, loves to snowboard and other sport. Creston looks forward to driving in a few years and the independence that goes along with it, and he's hoping that a diabetic alert dog will help him better manage his blood sugar levels so he can enjoy his autonomy. "I like the idea of having a dog that can tell me what my blood (sugar level) is or that I need to check it," Vaught said. "If I'm out with friends and I don't know what my blood sugar is doing, the dog will alert me." diabetes. About one child or adolescent out of every 400 has a form of diabetes. In Kerr County, the Texas Department of State Health Services reported in 2007 that 7.4 percent of the population was diagnosed with diabetes. Vaught was diagnosed with Type 1 diabetes when he was 4 years old, and he and his family have worked hard to manage the condition. "This is a day-in, day-out thing," said Creston's mother, Anne Vaught. "Creston never gets a break. It's not the type of disease where you get a little sick and then you get a little better. It affects everything he does. We've been in the ICU many, many, many times. (Diabetes) has robbed him and the family of joy, emotions and finances. The disease is just neverending. As a mom, you tend to, in desperation, look at all the different avenues to get help." Searching the options available to diabetics to help them manage their blood sugar is what led the Vaught family to discover diabetic alert dogs. About four years ago, Anne Vaught decided to seriously search for a dog for her son to help him manage the disease as he gets older and more independent. Jo Ann Hagemeier, a dietitian and employee wellness coordinator at Peterson Regional Medical Center, said managing diabetes as a child and adolescent can be tricky. "The difference with a teen is they are growing," she said, adding that puberty can alter a child's metabolism and how their body processes blood sugar. "It's a challenge that they need to know and understand their body." Type 1 diabetes is a chronic disease where the pancreas produces little to no insulin, which is needed to get glucose into cells for energy. 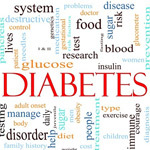 Type 2 diabetes, a more common form of the disease, is when a body's fat, liver and muscle cells are resistant to insulin, and blood sugars do not get into the cells to be stored as energy. Creston Vaught is considered a "brittle" diabetic, which means he can have large swings in his blood sugar levels, causing either hypoglycemia -- low blood sugar -- or hyperglycemia -- high blood sugar. "If I'm trying to get through a (high or low), I usually ask for help from my mother or father," Creston said. "The low range makes you feel drowsy and dizzy and that everything is falling apart. The high range feels like everything is cramped up and horrible and not working. I want to get back to the stage where I don't feel horrible." He hopes Archer, a labrador retriever the family will receive Aug. 23, will help him stay more stable as he enters high school and eventually starts driving. Archer has a very sensitive sense of smell and will be able to detect high and low shifts in Creston's blood sugar before he would notice the change. The dog constantly will be with Creston Vaught to help him monitor his condition. "I really want (the dog) so I can keep my blood sugar in check, because there are so many risks having diabetes," Creston said. "If I'm driving and go low and I don't realize, I could cause a wreck. If I have that dog that can alert me, I can pull over at the closest spot and check and treat myself." The Vaughts are getting Archer through Diabetic Alert Dogs by Warren Retrievers based out of Richmond, Va. The cost of getting a diabetic alert dog is around $20,000, but Anne Vaught said the cost is worth keeping her son healthy. "(The highs and lows) create so much stress and so much havoc on (Creston's) body," she said. "We're just hoping we're going to rein it in and have even tighter control. My whole thought about this, as a mom, is quality and quantity of life for my son, and I will do whatever I have to do to bring that into its fullness. For our family, it's going to change everything." The family also is looking into starting a program to help other children with diabetes in the area afford a diabetic alert dog. Those interested in donating to help a diabetic child in the Hill Country afford an alert dog can visit www.guardianangelservicedogs.org for more information.